On February 13, 2014, Galloway Police responded to multiple accidents involving injuries and entrapment. At 7:48 a.m., Galloway Township Police responded to the first Motor Vehicle Accident. According to Galloway Police, Steven Michael III, 22 of Egg Harbor City was driving a 1995 Toyota 4-Runner was driving north on S. Cologne Ave.
Steven lost control of his vehicle on the slush covered roadway and slid head on into a 1997 Saturn SL driven by Jeffery Eddeston, 56 of Egg Harbor City who was driving south on S. Cologne Ave.. Jeffrey had to be extricated from his vehicle by the Pomona FD with the assistance of Germania F.D..
Jeffrey was transported by EMS and Medics to Atlanticare Medical Center City Division for non-life threatening injuries. Steven was treated by EMS and released on scene for non-life threatening injuries. Germania and Pomona Vol. Fire Companies, Galloway Twp. Ambulance Squad, Atlanticare Medic 7 and Hamilton Township Police Department were assisting agencies for this accident. 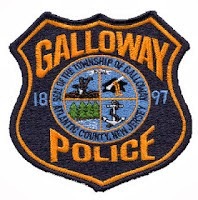 Later in the day, at 1:06 p.m., Galloway Township Police responded to another Motor Vehicle Accident with injuries and entrapment. At the second accident according to Police, Robert Earling, 74, of Hammonton was driving a 2003 GMC Sierra pick-up truck north on Odessa Ave just north of Duerer Street when he lost control of his vehicle for an unknown reason. Robert’s vehicle crossed the center line and ran off the west side of the roadway where it hit several objects before coming to a rest. Robert had to be extricated from his vehicle by the Pomona FD. Robert was transported by EMS and Medics to Atlanticare Regional Medical Center – City Campus for non-life threatening injuries. Pomona Vol. Fire Company, Galloway Twp. Ambulance Squad and Atlanticare Medic 7 were assisting agencies for this accident.